Because of the late night last night (I think nervous energy kept us all going & obviously we had a look around the villa when we arrived), it meant it was nearly midnight US time by the time we were all finally in bed. We woke at 7.30am. Now initially we had planned to go to MK, but decide to abandon our 1st days plans (whaaat? ). 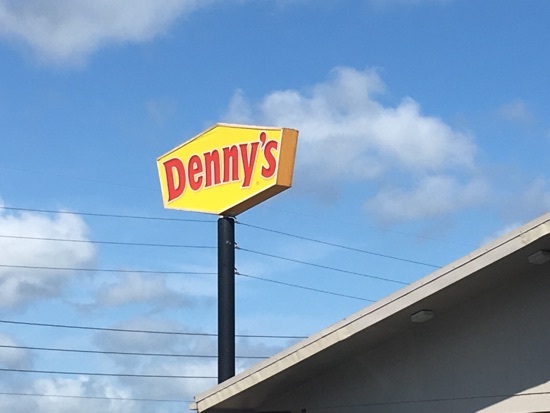 Instead we introduce the kids to the USA with the famous Denny's breakfast! We had a ‘welcome ‘ pack in our villa consisting of bread, jam, tea bags, a small jar of instant coffee, cornflakes, washing up liquid and 2 dishwasher tablets. The kids had been looking forward to pancakes and DH wanted his ‘Grand Slam’! 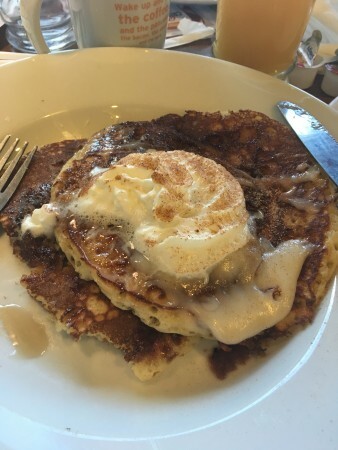 I had the cinnamon pancakes with bacon, sausage links & hash browns. Youngest DD had the birthday pancakes, eldest DD plain pancakes with absolutely nothing on them!  - she is quite fussy! for a purple bunny and a turtle. 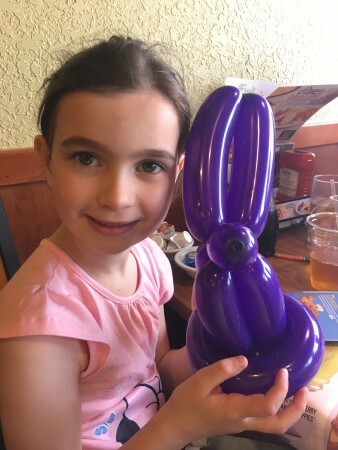 The girls found it hilarious being referred to as ‘my babies’ (by the server), and ‘princess’ by the balloon guy. I gave him a $5 tip by the way as he spent ages telling middle DD loads of turtle facts after she told him she wanted to get a pet turtle on our return and name him Denny! 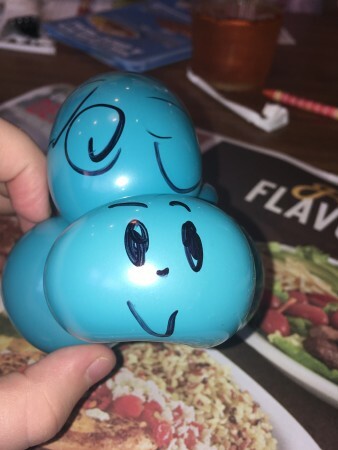 Total cost of Denny’s was $55 + $11 tip left. We next decided to get our Walmart shop done so we had some waters, lunch items & snacks to make a pack-up. What can I say, the kids were just in awe at the enormous size of all the products (ok, so was I! - I don’t actually think I went into a Walmart on any of my previous trips years ago). $300 dollars later  (this includes kids purchases which we settle up later). Some of the costs were v high, eg Weetabix (which I was going to bring but decided against, ha!). We bought 2 big trays of water bottles, beers, various canned drinks, wine (all the important things &#128521 , some big packs of Lays, ham, cheese, wraps, toilet paper, sandwich bags. Oh, not forgetting the wonderful huge tubs of pre-cut watermelon, tubs grapes, strawberries etc. This for me is lovely, as back in the UK I go through 3 of the Sainsbury’s punnets of grapes per week! And the watermelon quality out here is just far far superior to anything back home. Also got some frozen pizzas & other meals, and voila, our huge American fridge freezer is nicely full! Had a bit of an embarrassing moment as we exited Walmart- there was an employee in the foyer checking that you had a receipt before you could leave. We had ours, so that was ok & he thanked us for our custom, told us “you’all have a nice day now “ and put his hand up - which I took as a high five - didn’t want to leave him hanging, so high-fived him! Turns out, he was just directing me away from incoming customers! . DH & the kids were nearly on the floor laughing at me. To make it worse there were other British exiting the store behind us who had a little laugh (to be fair I would’ve done in their position! ), but I couldn’t get out of there fast enough after that! Right, that’s it, I won’t be high-fiving anyone again! Anyhow, we drove back to the villa, put the shopping away, had lunch & finished the rest of our unpacking. Also had a paddle in the pool- only to discover it’s freezing cold. I’d paid £385 extra for the luxury of pool heat which was recommended, so this didn’t please too much. We thought maybe we had to switch it on, so started looking at the home manual- nothing mentioned there apart from safety features & pool lighting. We also found out the kettle doesn’t work, so had to boil water in a saucepan (although we later find a stove-top kettle hidden in another cupboard). Additionally we couldn’t connect to the Internet. We tried the network & log-on in the home manual, but on the sheet from Ocean Florida was a completely different one. We tried both to no avail. DH tried re-setting the router but still nothing & it seems to have far more switches & buttons than ours at home, so we put a call into the management company and head off to Disney Springs to buy Magic Bands courtesy of the free $150 card for booking with Ocean Florida. It’s been 23 years since DH and I had our honeymoon here and it just (obviously) doesn’t bear any resemblance at all to the area I remember- obviously it’s hugely improved (imo). We found World of Disney, and the Market place co-op. 4 of us chose plain bands. It was the youngest 2 who wanted Stitch and Figment Bands. These purchased (roughly $15 per plain band & $30 per personalised band - youngest 2 also had their names put on their bands), we have a mooch around and an ice cream each ($5.95 each x 6). 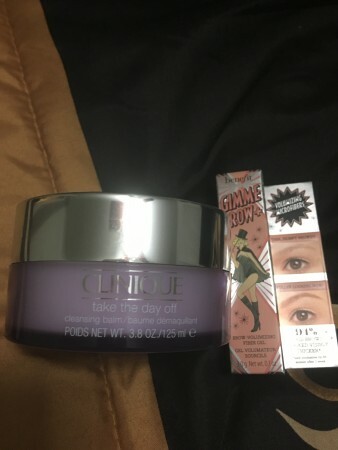 DD found Sephora and desperately and wanted to buy some Clinique ‘Take the day away’ make-up remover and balm. 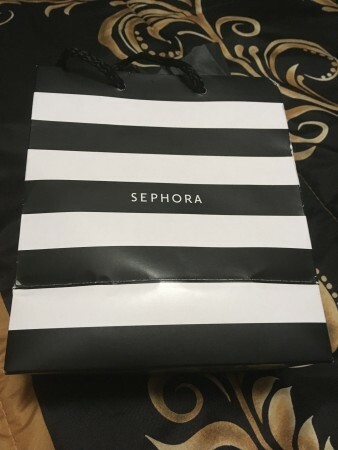 She’d wanted to get this at Gatwick but only had enough GBP for 1 item and went for the Clinique Moisturiser at Gatwick. So she decides to compliment it with the make-up remover product. Now, she’s only 12 but owns far more make-up than me, and also knows how to apply it better than I do (on account of the endless make-up tutorials she watches!). 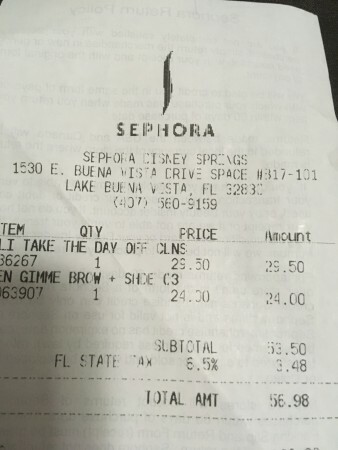 She’s been on at me to buy brow pomade or similar for a while, so decides to show me the Benefit section. We are approached by a male employee from that section and asks DD “what shade do you think would suit Mom?” (Not that I had intended to buy any!). DD picks out a shade which he agrees with & he then says “Let’s give Mom a little makeover” (without asking me 1st!). Before I know it, he’s training DD in the correct technique of applying it on to me, and I have to say they did look a lot better, so 狼, don’t tell DH, but I buy one for $24.95! 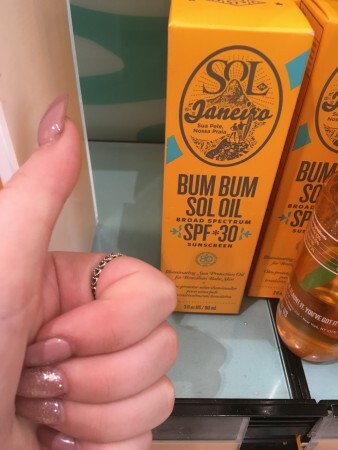 Talking of cheeks, DD was highly amused at finding this product! We stopped to see some young dancers performing on the little stage. Generally we end up spending a lot longer there than planned. We’re all starting to get tired & grumpy, so head back to the villa. A few minutes later a lady from the MC turns up & sorts out the Internet but tells us that the pool heat wasn’t switched on until our arrival & will take 48hrs to heat up. We’ve never had our own pool, so take her word for it, although we are a little peeved at this tbh. Love your High Five story! That made me laugh! Sounds like a erally nice first day, apart from the cold pool and wifi, but hopefully they will get sorted. really chuckling at the high five story this is definitely something I would do, your 12 year old sounds exactly like my 12 year old daughter too. Wow your 12 year old is impressively clued up on the make up eh? I did lol at your high 5 (sorry!). at your high five... sorry!